Lake Las Vegas Water Sports & Vegas Balloon Rides invite you to explore Las Vegas as you’ve never seen it before! Get carried away on a Hot Air Balloon adventure, relax on your smooth water cruise of Lake Las Vegas and enjoy a spectacular Champagne brunch to round out your morning. During your flight you will experience a bird’s eye view of the famous Las Vegas Strip, beautiful Lake Las Vegas, the Sunrise and Frenchman Mountains and Lake Mead National Park in the distance. You will be enveloped in tranquil peace as you float over the lake and countryside for approximately 45-60 minutes where you will also watch for wildlife and chat with envious onlookers down below. Upon landing, you will be escorted to Lake Las Vegas Village where your scrumptious brunch awaits you aboard a Duffy boat. 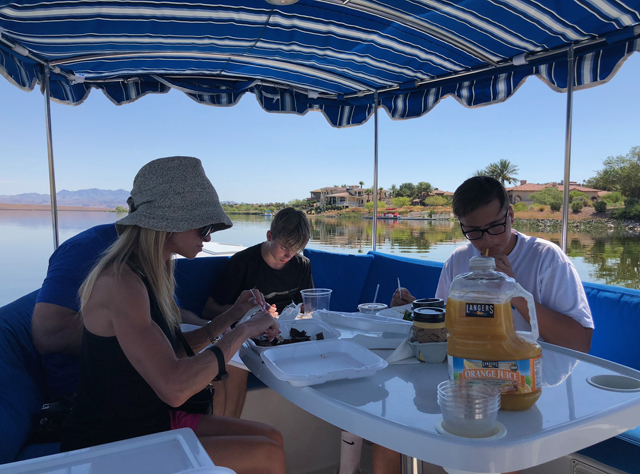 Your pilot will captain this vessel during your 30-minute cruise around beautiful Lake Las Vegas as you continue to celebrate your morning adventure with brunch from Le Café Du Lac and our signature Champagne toast. (Non-alcoholic drinks are also available). Tour duration approximately 4-4.5 hours including luxury round-trip transfers from the Las Vegas Strip & Downtown hotels.